This column is so late, it’s as good as expired. And alas, it’s not even the article it once was or was meant to be. Blame it on the archive (or lack thereof) and the machine (ditto), definitely on the so-called nonverbal and a rather limp attempt at montage. In late August, my house was broken into and my laptop was stolen. There are many parallels between the exhibition whose review I was writing and the ensuing robbery drama: the aforementioned foursome (archive, machine, nonverbal, and montage), as well as intermittent mental trickery and deceit, self-study and reflection, surveillance (again, lack thereof), plus some mildly entertaining buffoonery from the boys in blue. The review was of the HF | RG show on view from April 7 through June 7, 2009 at Paris’ Jeu de Paume: HF being Harun Farocki and RG, Rodney Graham, the “ | ” a reference to Roland Barthes’s S/Z, that famed post-structuralist survey of Balzac’s pouty novella Sarrasine. Very much a dual(ling) retrospective of two of the world’s leading artists, the exhibition was ambitious and sprawling, august in reach, if somewhat peculiar and confused in its ping-pong effect. HF | RG was less a dialogue than a fascinating lesson in disparity, conceived as an environmental and intellectual montage based on the ubiquitous notion of the hyperlink. Not clickable in this case, but instantly transportable across worlds—imaginary (definitely of the Lacanian persuasion), virtual, theoretical, representational, flickering, fleeting, and, in some instances, noisy. In short, a polysemic world with very few boundaries, but nevertheless one with a refreshingly experimental ethos rarely encountered in museum settings, especially in North America. The exhibition was the brainchild of Chantal Pontbriand of Montréal’s Parachute (RIP) fame, and it was instantly likened to a high-stakes game of tennis; an analogy befitting the historical function of the Renaissance venue. While these four “concept-codes” were meant as a guide for understanding the work of these titans, their applicability to countless contemporary artists produced instant suspicion. The two artists admittedly intersect across certain, broad-ranging forcefields, as in their use of moving images—the image in history in Farocki’s case, and image history in Graham’s. Yet anyone familiar with Farocki and Graham knows that their differences far outweigh their similarities, and that their sensibilities embody two opposing poles of a spectrum: the rigourously political, sly, suave, subject- over-style German vs. the playful, role-playing, amazingly versatile, pop but brainy Canadian. In the corridor leading up to the exhibition, a small flat-screen monitor displayed a trailer for Farocki’s Deep Play, his mesmerizing, monumental work for documenta 12, a multi-angled examination and analysis of the infamous French/Italian showdown at the 2006 World Cup. As the referee blew his whistle, the game was on! Another preface was fashioned in the foyer, forecasting the pending juxtapositions. Graham’s gorgeous, large-scale gelatin prints of upside-down trees lined one wall, as Farocki’s two-channel installation Comparison Via a Third (2007) played on two monitors on the adjacent wall. The three photographs (Cedars, Stanley Park 1, 5 & 7, 1991-1999), taken from Graham’s large camera obscura drolly dwelling in a Canadian forest are handsome and anarchic, playful and strangely sombre. 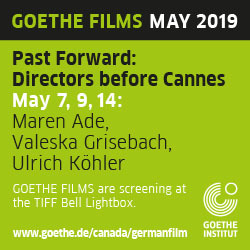 Comparison is an earlier version of In Comparison, Farocki’s 61-minute 16mm film still travelling the festival circuit. The 24-minute installation version seems to consist of mostly the same footage, though the two channels alternatively flicker on and off, so the enjeu of comparison is made ever more explicit; the work engages in an overt binary structure in keeping with the piece’s internal zigzag development. Both the installation and the film demonstrate Farocki’s notion of “soft editing,” a non-hierarchical montage allowing for maximum deduction from the viewer—a surreptitious lesson in film construction and language, which, if one were so inclined, could make the leap back to Barthes (though closer to de Saussure). Renowned for his vast oeuvre of essayistic works, Farocki approaches filmmaking like a theoretician, acutely aware that every subsequent image alters and appends meaning to create cinematic language. It’s the Godardaphile in him. He often works in meta-cinema mode, though the two Comparisons are more lyrical and arbitrary than one might expect. Both are contemplative (deceptively so) documentary works about contemporary brick production, spanning continents and cultures. By focusing on the brick and tracing its contexts, from the collective efforts of a community building a clinic in Burkina Faso, through semi-industrialized mouldings in India, to industrial production lines in Europe, Farocki also elaborates a metaphor for filmmaking: Thomas Elsaesser correctly posits that “Via a Third” is via filmmaking itself. Eschewing traditional commentary, but employing a deft, willful and mischievous point-of-view, the Comparison installation and film present various methods of labour production, allowing for an assessment that changes with every layer and goes beyond the binary divide that appears to be their premise. In other words, the works are playful, alert to the innate beauty of forms, rows, clay, fabric, and skin that gleams in the sunlight. The repetitive movements and shapes operating under the harsh glare of the fluorescents in sterile factories reveal their own compelling aesthetics—particularly of the machine, with its hypnotic rhythms and musique concrète clatter. Farocki’s films have often emphasized the machine-like qualities of the camera, something this exhibition demonstrated to the nth degree. And while the two Comparisons can be seen as a comparative study, the works are so rich in imagery that their revelatory function encourages inquiry as much as wonderment for what the world contains, from muscular bodies in motion, infectious camaraderie and shimmering fabrics, to leaps in modern progress, with their attendant complicated and contradictory implications. Amid this polyphonic array, the image of the hand dominates, positing a wide-ranging idea of labour that’s as rich with meaning as a building block. A perfect segue is found in Farocki’s Workers Leaving the Factory in Eleven Decades (2006), which played on 11 monitors placed on the floor in a horizontal row, stemming from the iconological images from the late 19th century of workers exiting a factory in Lyon recorded by the Lumières. Delving into each decade of film history, Farocki selected similar scenes from Metropolis (1927), Modern Times (1936), Red Desert (1964), and others, through to Dancer in the Dark (2000), the expression shifting from stoicism, to confusion and befuddlement to utter anguish. With many more people leaving the factories with job losses, especially in the industrial and manufacturing sectors, at an all time high, this early cinema scene remains as prescient as ever. Filmmakers like Ben Russell and Sharon Lockhart have also recently contributed to this iconology (Trypps #5 (Dubai) and Exit), and while Farocki’s installation is as much about cinema and its evolution, it also serves as a reminder for the medium’s constant mise en abyme with a reality inextricable from its own representation. That first packed room also included Farocki’s two-monitor Interface (1995) about film editing (montage! 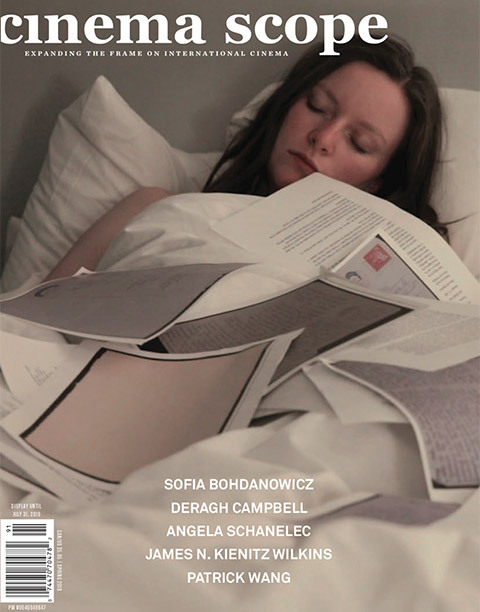 ), a long, rectangular vitrine showcasing the covers of numerous Filmkritiks, the influential German film magazine for which Farocki frequently contributed, and a copy of Speaking of Godard, a study co-authored with Kaja Silverman. Eye/Machine (2000), another of Farocki’s major works, rounded up this dense grouping. From montage theory, Gulf War guns, and surveillance footage, the gallery-goer was jettisoned into a ‘70s shag room where Graham’s Vexation Island (1997) How I Became a Ramblin’ Man (1999) and City/Self (2000) played on freestanding large-screen monitors, all looking too groovy (décor and installation) and goofy (the work itself). As stark as night and day, everything attributed to Graham (films, photos, and pop songs) seemed shiny and shallow—high-gloss theatricality and trite compared to Farocki’s serious and somewhat academic inquiries. Far from my favourite works by Graham, the films remain rich in allusion, original in their own ways and as much about the language of cinema as Farocki’s. The tennis match seemed rigged. That is, until the next room where one encountered Graham’s astonishing ten-minute double projection Loudhailer (2003), which consists of two large-scale 35mm pedestal projectors, their loopers, and two sizable wall projections of one overlapping image of Graham, dressed as an RCMP officer teetering on the wing of a plane landed on choppy waters. Standing legs apart, our stranded hero bellows from a megaphone “bring a dinghy,” looking both charmingly macho and hopelessly pathetic. While the loud whirring of the machines fill the room, the sound consists of a three-minute loop, so the muffled plea for help morphs into a chorus or mantra. Monotone and straightforward at first, the situation grows more precarious over time. Loudhailer is a riot in both sound and experience; it’s commanding in scale and audio, but also because of how it toys with viewer expectations in ways both tongue in cheek and about the fundamentals of spectatorship, and how these largely rely on the sound-image construction within the cinema. As with Rheinmetall/Victoria 8 (2003), one of the artist’s signature and oft-shown works, the 35mm projectors are integral to the piece, for their sculpture-like qualities as well as their contribution to the rapidly changing aesthetic of cinema. For the teeming HF | RG exhibition, the curator used every nook and cranny the Jeu de Paume had to offer. In the landing leading from the stairs one found Farocki’s In-Formation (2005), a video collage of pictograms about migration and immigration that seemed especially pertinent in its odd placement before a huge window looking onto the Tuileries. Semi-transparent blinds hung down to filter the daylight, but were too short for the window proper so a gap depicted passersby from the knees down as they walked along one of the park’s dirt paths. The interplay between outside and in, natural movement and produced stasis, was strangely moving when thought of within the context of the Tuileries being a public park in an expensive, increasingly diverse city. This tiny piece was one of the show’s highpoints; theory met practice in a way both poignant and surreptitious. Few spent time in this alcove, passing right over a small monitor showing Farocki’s Expression of Hands (1997), another iconological piece which mines cinema—and instead plunged into the abyss of Deep Play as the flushing sound of crowds and excitement leaked beneath the door. A showstopper in every sense of the word, Deep Play, is a real time, multi-angled play-by-play analysis of the match forever made famous by the Zidane money shot. Twelve monitors adorned the walls and green Astroturf covered the floor. Spongy cube furniture encouraged patrons to sit, and sit they did for huge swaths of time. Even the security guards abandoned their posts to relive the excitement and ultimate French defeat. The constant blare of images depicted the various points of view analyzing the game—the army of players behind the players, TV commentators, video graphics, surveillance footage recorded outside of the stadium. Elsaesser calls it an exploration of “the military-entertainment complex”—a natural progression from the investigations into the military-industrial complexes that form a significant part of Farocki’s oeuvre. By and large, patrons focused on one or two monitors solely, with the occasional head pan, back and forth, for a full view of the immersive installation. The game, devoid of all of its trimmings and the behind-the-scenes show, remained the focal point. Deep Play was the most contemplated and engrossing work of the entire exhibition, but perhaps not for the right reasons. One emerged from the completely enclosed space exhilarated and exhausted, only to encounter some of Graham’s superlative works, including his magical Coruscating Cinnamon Granules (1996), with its Plexiglass rectilinear receptacle showcasing the perpetual unspooling of the film as it was looped back onto the projector, doing so, with elegance and nostalgic enchantment. Then came his book covers, reading machines, and the Mini Rotary Psycho Opticon (2008), apparently inspired by the mise en scène of a Black Sabbath concert shown on Belgian TV in the early ‘70s. Conceptual art at its finest, Graham’s textual interpolations are some of his richest, engaging works by Freud, Edgar Allan Poe, Lewis Carroll, and de Saussure, and compositions by Wagner. His book covers and ephemera—including the starched White Shirt (Mallarmé)—demand considered concentration. While the work is playful in a Dada kind of way, few patrons noticed. The 180-degree shift in tone and tenor from Deep Play and this brightly lit space with its numerous vitrines was too much, driving viewers instead to the next dark space and Farocki’s landmark Vietnam essay film, The Inextinguishable Fire (1969), paired with Immersion (2009), commissioned for the exhibition. Like Omer Fast’s The Casting, Immersion explores trauma in US soldiers back from combat in Iraq and Afghanistan. Though ostensibly a documentary examining the treatment of post-traumatic stress disorder through the use of virtual reality at a California lab, the piece seemed hardly real. The doctors appear overly dispassionate and the soldiers brutish and hysterical. And that was the horror—that the real could look and sound as such, then wrapped into a video-game aesthetic where conditioning and distanciation become the operative measures. That the virtual is used to rehabilitate the real comments not only on global image culture run amok, but also on the true avant-garde nature of Farocki’s work. Graham’s new piece is a diptych lightbox photograph entitled Dance!!! (2008), in which the artist embodies a genteel man forced to play the fool and dance in order to dodge bullets from bandits. Playing with the tropes and conventions of cinema extending from his earlier filmic works, in this case the (Spaghetti) western, the chiaroscuro lighting and gestures recall images from Abu Ghraib, though political references remain speculative. The incentive is there, set up by Farocki, yet the chromogenic transparencies are high-gloss and have a Pop effect, effectively jarring with Farocki’s digital, often repurposed, swimmy images. The pièce de résistance, however, was Graham’s The Gifted Amateur, Nov. 10th, 1962, (2007), a triptych depicting Graham as the painter Morris Louis in blue silk pajamas creating a drip painting, employing his modernist living room as a studio. It’s a dazzling photograph, a simultaneous critique and homage to image production and its grand history and mythos—a refreshing rejoinder to the heaviness and alarm of Farocki’s films. And still two rooms remained. The first showed Farocki’s I Thought I Was Seeing Convicts (2006), coupled with Graham’s Halcion Sleep (1994), installed up in a corner as if it were Malevich’s Black Square. Ironically, the themes of sleep, over-stimulation, and the exacerbation of image consumption mirrored the gallery-going experience. A clever direct link was made from Farocki’s treatise on surveillance and the voyeuristic stance the viewer automatically develops with a sleeping Graham nestled in the backseat of a car. The history and evolution of vision, surveillance, of the dissolution between public and private, is inextricably linked to technological change and new ways of seeing; this was a message consistently announced throughout the show. It concluded with a tinge of melancholia, with Graham’s masterful Rheinmetall/ Victoria 8, which pairs a massive 35mm projector from the ‘60s with images of a German typewriter from the ‘30s. The whirring of the projector provides the soundtrack as white flour falls gently on the keys, ultimately covering up the old beautiful clunker. Not unlike Tacita Dean, Graham’s greatest works are those that deal with obsolescence, doing so in a materialist way that legitimizes objecthood, even in the ephemeral and fleeting. Farocki, too, is evidently engaged in the drama of forgetting, when memory is displaced, erased, and finally replaced by images. But whereas Graham emerged as the formalist, demonstrating an intellectual rigour matched by a pop sensibility, Farocki’s humour and own sense of form took a backseat to his political agenda. The former’s satirical portrayals, Sisyphean self-portraits and slick production values were seductive but also seemed somewhat hackneyed juxtaposed with Farocki’s personal involvement of a more urgent nature. HF | RG was an odd show, creating false parallels that undermined the work yet fully admirable in pushing the boundaries of gallery-going and striving for intellectual engagement. Farocki’s commitment to a social agenda as an artist rose to the foreground, while Graham’s performative romanticism and interest in psychedelics and psychology seemed more codified. In the end, the Barthes reference was completely apt: the plurality of the text won out and I was just feeling lucky to have seen so much great work. The idea of the definitive went out the window (literally) when my laptop was stolen, and this review was begun anew.